While the dust is just settling at Trestles following the Boost Mobile Pro that was won by some surfer out of Florida named Slater last week, the 2008 ASP World Tour moves quickly along and is set to begin it’s European two-step. It’s a dance that could start as early as Friday with the opening of the holding period for the 2008 Quiksilver Pro France. There are none more excited about this leg of the tour than Europe’s record four surfers from the Top 45 that will represent the continent in the next two events. Aritz Aranburu(Spain), Tiago Pires(Portugal), and Frenchmen Jeremy Flores and Mikey Picon proudly symbolize what is a rapidly growing brigade of top European surfing talent and are undoubtedly looking forward to having the Dream Tour’s version of home-field advantage on their sides for the stops in France and Spain. Reigning world-champion Mick Fanning comes in as the defending champion of this event as he took out South-African Greg Emslie on his way to a victory here in 2007. Following a disappointing performance at Trestles for Fanning, Mick will no doubt be coming into the Quik Pro France with guns ablazing. It goes without saying that all eyes will be firmly squared on that guy named Slater as the event gets underway. A French-victory combined with less than stellar results from the Aussie-brigade will essentially put the seal on #9. 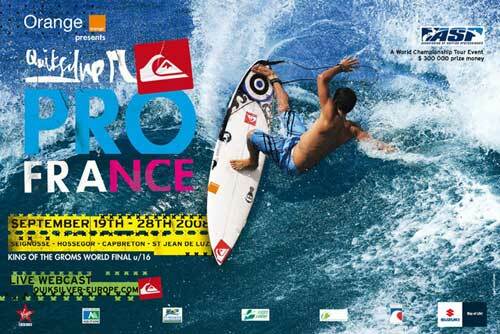 The competition sites will once again be between Seignosse and Saint-Jean-de-Luz and including Hossegor and Capbreton. With the action getting set to get underway, you definitely want to stay tuned to 5’s for more info regarding the 2008 Quiksilver Pro France. And while you webcast junkies are patiently waiting for the 8th stop of the tour to kick-off you can check out the video from last years final. Posted by Shaun	on Wednesday, September 17th, 2008	in Surfing. wow… i think emslie should have taken that final. smooth powerful turns vs fanny’s short and snappy. and if thats just my personal opinion then let homeboy’s little shackle be the decider. those judges are either smoking booty or can’t help but being influenced by celebrity. Great event! Check the finals out. Should Kelly have won?